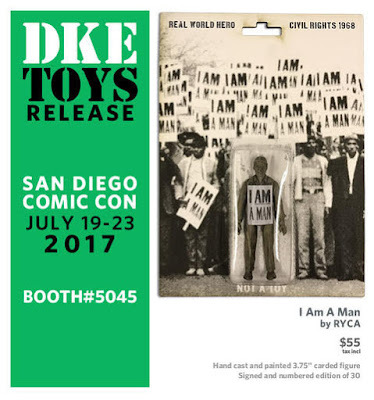 DKE Toys is going to have an insane line-up of San Diego Comic-Con exclusive resin figures again this year at their booth #5045, and The Blot can’t wait to see them all! First up is a killer Star Wars themed exclusives by UK artist RYCA (aka Ryan Callanan). 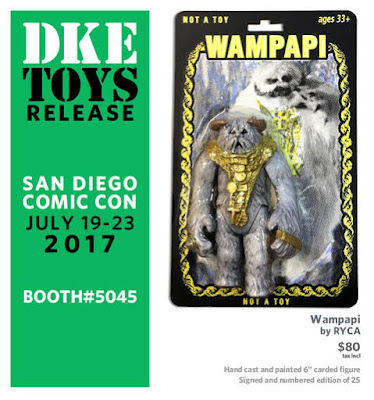 The Blot really loves this blinged out San Diego Comic-Con 2017 Exclusive Wampapi resin figure! What a fun take on the classic 6” vintage Kenner toy. What’s really crazy is the Wampapi comes wearing a real 23.5kt gold leaf and a Swarovski crystal! Limited to just 25 signed and numbered pieces, this carded figure retails for $80. Last but not least is the San Diego Comic Con 2017 Exclusive I Am A Man Resin Figure! RYCA never shies away from political statements, and this is one of the most powerful pieces DKE Toys has ever had. Limited to 30 signed and numbered pieces, each hand cast and painted 3.75” carded figure retails for $55. As with all of his resin figure releases, RYCA silk screens and die cuts his own card backs as well as make his own blisters. Making each one truly one of a kind!